What’s a Data Scientist, Anyway? Worst Week in Social Ads: Twitter or Facebook? Not a good week for the social giants. So much for Twitter’s “Trump Bump.” This platform saw the first decline in ad revenue since the company went public in 2013, reports Fortune. And Facebook is facing an audit of its ad data after coming under fire in 2016 for misreporting metrics. Here’s the inside scoop on that mess. Oh, and Facebook announced that videos will play with the sound on. People aren’t happy. This week, I’m taking a break from Trump news. But I do want to share this Vice story (I highlighted a shorter New York Times piece a few weeks ago), and this rebuttal explaining why it’s not a big deal. But that’s all. Click at your own risk. In researching this newsletter, I find a lot of case studies. Most explain how a company used data insights to increase sales. But This New York Times article is awesome because it looks at how universities use big data to predict graduation rates (and help students succeed). Advocates are worried about data from NYC’s identification card program (mostly for the city’s immigrant population) being put to nefarious uses in the current political climate. FiveThirtyEight looks into what it takes to delete data. The above quote explains what they find. Thanks, New York Times. This week we learned that millennials aren’t as bad as we all thought. It’s actually Gen Xers who spend the most time on social media. Ha! If you are looking for a quick understanding of SEO trends and the field’s major changes, this Forbes article provides a clear, concise recap. 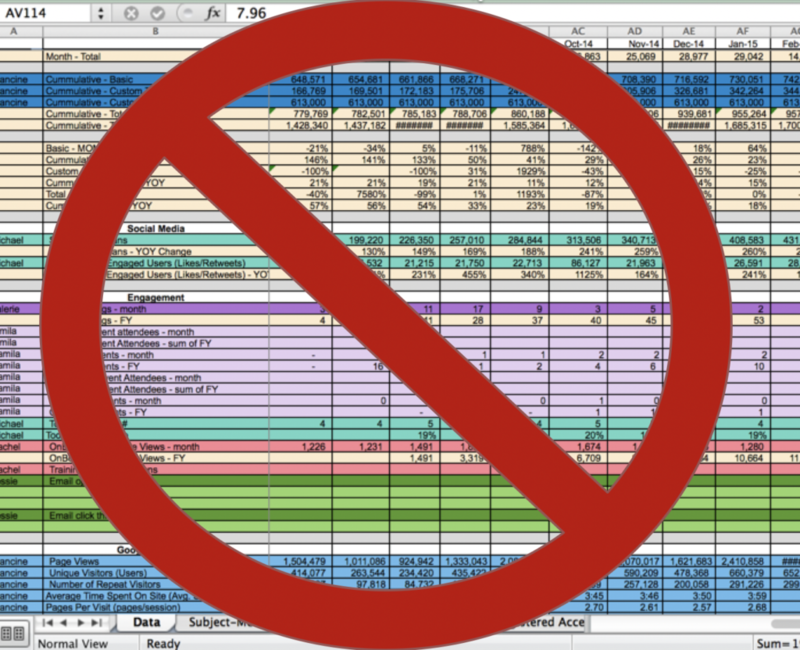 Many non-profits have a giant spreadsheet. Every time staff send an email, post to social media or write a blog post, they record the key metrics in their enormous Excel spreadsheet or Google Sheet. This sounds like a good idea, right? This way, your organization has all the data staff need to gain vital insights into your communications work. Staff can look at the metrics and know exactly what content, messages and channels are most effective. They have all the data they need to make decisions. Except it never works that way! Maybe, you make a few charts from the data for your annual report (Facebook likes are up this year!). But you never use it to make actual day-to-day choices about your website design, social media content or marketing strategy.